I am Jhani, author of this blog, Native of Yadagirigutta, while browsing on internet in 2007 one day i couldn't find more information and pictures about Yadagirigutta, accordingly i have started this blog (yadagirigutta.blgspot.com) in 2007, to say some thing and show some thing about Yadagirigutta. 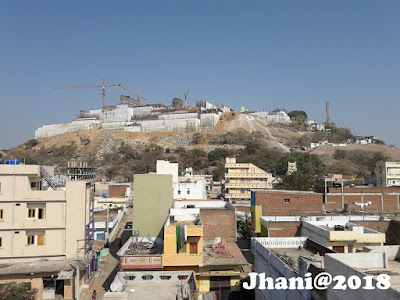 and continually updating time to time and convert my blog in to website (www.yadagirigutta.net) and maintaining with my own expenses since 2007 and i am very happy now this blog is on top in Google search for Yadagirigutta route map, photos and for information. I have been never thought for my own publicity or to earn income through this my website since 2007, which very well know the readers of this website since then following, as this site have thousands of subscribers and RSS feeders now. Now a days I have been observing lots of other persons, websites, FB pages have been using this domain name (www.yadagirigutta.net) and propagating as this is their website. Now I decided to update this website with my photo so people can recognize that whom this site belongs to. Moreover, Please be informed, i have never ask or request to anybody regarding the money or any their personal details etc., till date, so please careful if anybody receiving such emails or messages etc., and you can also directly contact me through below address if any clarifications required about it. I am only having all rights of www.yadagirigutta.net website and i am only the Writer, Admin and Editor of this Website, i don't have any agents or reporters for the same. please be noted. You are doing a wonderful work by posting valuable information on Yadagirigutta. Keep it up. ThanQ Mr. Jhani.You are a real devotee of Swamy Laxmi NarasimhaSwamy and offering good services to us since a long time.Plz continue the task undertaken,GOD Bless You. Great work you are doing Mr.Juanita. Really commendable. Please continue your good work. God blesses u . Please give information on 4 line roads leading to yadadri from nearby villages. Thanq all above for your appreciations and comments.. ...and Raju Gaaru.. will post with full detailed about the 4 Lines roads which laying from 4 directions of Yadadri..